Spontaneous Nosebleed. Most nosebleeds start up without a known cause. Rubbing. 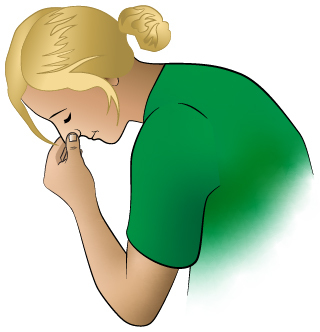 Rubbing or picking the nose is the most common known cause. It's hard to not touch or rub the nose. Blowing. Blowing the nose too hard can cause a nose bleed. Suctioning. Suctioning the nose can sometimes cause bleeding. This can happen if the suction tip is put in too far. Sinus Infections. The main symptoms are lots of dry snot and a blocked nose. This leads to extra nose blowing and picking. The sinus infection is more often viral than bacterial. Nose Allergies. The main symptom is a very itchy nose. This leads to extra rubbing and blowing. Dry Air. Dryness of the nasal lining makes it more likely to bleed. In the winter, forced air heating often can dry out the nose. Allergy Medicines. These help the nasal symptoms, but also dry out the nose. Ibuprofen and Aspirin. These medicines increase the bleeding tendency. Aspirin is not used in children. Bleeding Disorder (Serious). This means the blood platelets or clotting factors are missing or not working right. A bleeding disorder should be suspected if the nosebleed can't be stopped. Excessive bleeding from the gums or with minor cuts is also a clue. Bleeding disorders are a rare cause of frequent nosebleeds. You should be able to stop the bleeding if you use the correct technique. Gently squeeze the soft parts of the lower nose together. Gently press them against the center wall for 10 minutes. This puts constant pressure on the bleeding point. If rebleeds, use the same technique again. If pressure alone fails, use a piece of gauze. Wet it with a few drops of water. Another option is to put a little petroleum jelly (such as Vaseline) on it. Insert the wet gauze into the side that is bleeding. Press again for 10 minutes. Reason it works: the gauze puts more pressure on the bleeding spot. Special nose drops: if your child has lots of nose bleeds, buy some decongestant nose drops. An example is Afrin. No prescription is needed. Put 3 drops on the gauze and press. The nose drops also shrink the blood vessels in the nose. Caution: don't use decongestant nose drops if your child is under 1 year of age. If you don't have gauze, use a piece of paper towel. Repeat the process of gently squeezing the lower soft parts of the nose. Do this for 10 minutes. If the air in your home is dry, use a humidifier to keep the nose from drying out. For nose blowing, blow gently. For nose suctioning, don't put the suction tip very far inside. Also, move it gently. Do not use aspirin and ibuprofen. Reason: Increases bleeding tendency. Bleeding areas in the front of the nose sometimes develop a scab. It may heal slowly and re-bleed. If that happens to your child, try this tip. Apply a small amount of petroleum jelly (Vaseline) to the spot. Repeat twice a day. Do not use for more than 1 week. Over 99% of nosebleeds will stop if you press on the right spot. It may take 10 minutes of direct pressure. After swallowing blood from a nosebleed, your child may vomit a little blood. Your child may also pass a dark stool tomorrow from swallowed blood. Sit up and lean forward. This will keep the blood from running down the back of the throat. Apply Pressure. Gently squeeze the lower soft parts of the nose against the center wall for 10-15 minutes. Use your thumb and your index finger in a pinching manner. If the bleeding continues, move your point of pressure and repeat again for another 10-15 minutes. Special Notes: The goal is to apply continuous pressure to the bleeding point inside the nose.